Flat cap screws are quick-assembly binding shafts which push together to close. Like our ultra-short clear screw posts, they can be pushed together with your fingers. 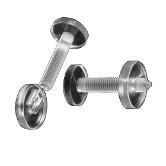 Available in three lengths, flat cap screws will fasten together materials ranging from approximately 1/8” to 1-3/8”. Use our ultra-short clear binding posts for binding materials less than 1/8" thick. Flat cap screws are difficult to disassemble, so they should be considered semi-permanent fasteners. The screws have circular rings, not threads. Since the screw will protrude through the button head, these are best used where the back side of the item being bound is not visible.